St. Augustine Lodge’s next meeting will be our 1000th with a very special guest, the Provincial Grand Master for Bristol Right Worshipful J.M.W.Davis. 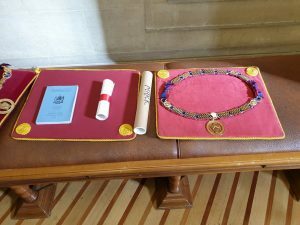 The collar of our very own Worshipful Brother Deputy Provincial Grand Master Michael Henry Huggins who was appointed and invested on 9th March 2019 at City Hall in Bristol. The current Worshipful Master must have too much time on his hands as he has redrawn the Lodge banner in readiness for our new Lodge cufflinks to celebrate our upcoming 1000th regular meeting. 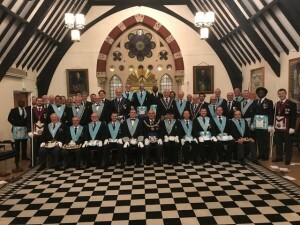 The Lodge was treated to a very interesting address “An Interesting Talk about Bristol Masonry” duly given by The Very Worshipful Bro.Christopher Williams, P.G.Swd,B. There is exciting news coming soon about one of our members. 9th March 2019, save the date! St. Augustine’s Senior and Junior Wardens attended the Annual Warden’s Dinner hosted at Freemason’s Hall Bristol on 4th February 2019. The purpose of the evening was to meet the new Executive Officers of the Province and to meet the fellow Wardens, who will in due course become the Circle of Masters of their year in the Chair. 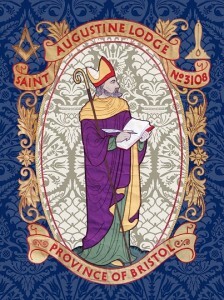 St. Augustine Lodge will be celebrating the 1000th regular meeting this coming May. One of the themes of the evening will be to remember the Brethren that served during the two twentieth century world wars. 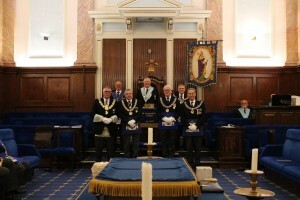 The PGM for Surrey and Brethren of Crescamus and St. Augustine Lodges. The Brethren of St. Augustine have been selected by the Provincial Grand Master of Bristol to carry out a demonstration of the Bristol Third Degree ceremony Saturday 28th April 2018 to the Crescamus Lodge 7776 and Surrey’s Light Blues Club situated in Croydon, South London, the Surrey Light Blues Club being their version of the Bristol Dunckerleys. This is a huge honour for the Lodge, the last time we were so honoured was in 2008 again in London. As we will be representing the Province of Bristol our Director of Ceremonies will be demanding our usual high standards at the March and April Third Degree ceremonies. The 984th regular meeting on Thursday 11th May 2017, St. Augustine Lodge had a special visit of the Provincial Grand Master of the Province of County Down in Ireland, the Provincial Grand Master of Gloucestershire, the Provincial Grand Master of Somerset and of course our very own Right Worshipful Provincial Grand Master of Bristol, Alan Vaughn.